In The Piano Lesson, by August Wilson, Berniece represents promise unfulfilled. Berniece, a smart and fairly young woman, is forced to work at a menial job because of her lack of education and formal training. She does the best she can with what she has, and with the help of her uncle Doaker (with whom she lives), manages to survive but minimally. Had Berniece been offered the right opportunities in life and not been African-American in 1936, her life might have been very different and much more financially stable. 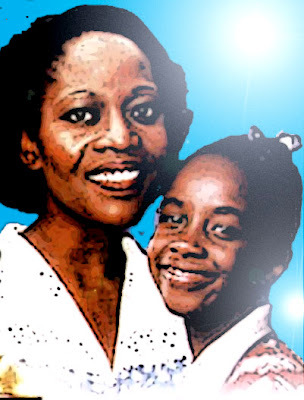 Berniece is a steady, hardworking middle-aged mother of one child, 11-year-old Maretha, and widow of a man who died a violent death while committing a crime with her brother Boy Willie and his friend Lymon Jackson. The death of her husband Crawley has left her embittered, especially against her brother (who she blames for the death); in addition, she is squeamish about jumping into a marriage with Avery, her on-again, off-again beau, a newly-minted preacher who is trying to set up his church. One gets the sense that Berniece had loved Crawley deeply, although he had been a bit of a renegade and who probably caused her many sleepless nights during their marriage. But now that she is a widow, she is determined, at least on the surface, not to get involved with another man. She is wary and does not trust men very much, except for the “safe” ones like Doaker and Wining Boy, who, ironically, have had their own issues with women. Despite her wariness, Berniece is a highly sensual woman, but she tries to keep her sensuality in check. With Avery, she succeeds in fending off his increasing romantic demands; however, with a little perfume and a few smooth words from Lymon, she nearly gives in to her sensual side. But at the last minute, she pulls away from the slick Lymon. After all, she must focus on raising her daughter, so romance must be on the bottom of her long list of life events. However, after she pulls away from Lymon, she is shocked; her strong sensuality scares her, so it is likely that, from now on, she will keep Lymon, a self-proclaimed womanizer, at a safe distance. Before Lymon comes into the picture, Berniece marrying Avery does seem to be in the back of her mind, but she’s hesitant because Avery, let’s face it, is not that sensual—he reserves his passion for the pulpit. However, Berniece would make an excellent minister’s wife, for she is accustomed to placing other people’s needs ahead of her own. She presents a steely front and is determined to keep the family history and tradition intact, and that family tradition is depicted on the piano that Boy Willie is determined to sell so that he can buy the Sutter farm. In order to keep the piano in the family, she is willing to shoot her own brother—not to kill him, of course, but, perhaps, to maim him slightly. Family is everything to her, even her troublesome younger brother, so she would never seriously harm him. Although she and Boy Willie, by the end, seem to patch up their immediate disagreement, they will always have a troubled and complicated relationship; the piano, safe for now, will always act as the wedge between them. To Berniece, the piano represents the family history and, therefore, should not be sold to a white stranger; however, to Boy Willie, the piano, just a pretty possession, represents the future because of the money it can bring so that he can create a better life for himself and his future children. To his way of thinking, family history remains in the family stories and the heart, not on some piece of wood that was, in the first place, a stolen item. Also left unresolved is Berniece’s bitterness toward Boy Willie for her husband’s death—that would be sure to crop up again at a future time, precipitated by yet another family crisis. Ironically, ever since her mother died, Berniece, wishing to keep the spirits of the past away, has been unable to play the piano herself, instead acceding that job to the next generation: Maretha, who may or may not eventually develop her piano-playing skills. At the moment, only she and Wining Boy have anything to do with playing the piano—and Wining Boy only sporadically, given that he shows up in Pittsburgh only when he is broke and needs a handout from family. Will Berniece ever remarry? I think so. If Avery does not get too impatient or she does not wait too long to say “yes,” she will probably marry him. If not Avery, she will meet someone similar: a steady, hardworking man who will always provide for his family and love his wife and children (including Maretha) above all else (except God). She will not marry Lymon or anyone like him; her sensual side will always cede to her sense of responsibility and family duty. Thus, she will never again put herself in a situation where she might find herself alone with Lymon or someone like him. In her mind, that kiss with Lymon was a wake-up call. Berniece, while mired in the past, prepares her daughter Maretha for the future by insisting that the child keep up her piano lessons and attend the settlement house events, probably at the Morgan Memorial House, an off-shoot of The Kingsley Association, then located at 1707 Penn Avenue, in Pittsburgh. The settlement house was a place where working class and underprivileged people, including children, could go to socialize and learn some practical knowledge and life skills. It is quite possible that Berniece and Maretha actually spent some time at The Kingsley Association itself, for Berniece, in passing, tells Maretha, “Don’t be going down there showing your color” (826), suggesting that they were mingling with white folks, also living in poverty. Thus, the pragmatic Berniece is preparing her daughter for living in a “white world” and playing the game according to white rules. Yes, according to Berniece, you “show your color” at home, but leave it there once you venture out into the world, at that time, predominately white. Berniece envisions Maretha becoming a teacher—whether or not that is what Maretha wants is another story, a story not yet told. If Berniece represents promise unfulfilled, then Maretha represents promise not yet fulfilled. Maretha is a static character in that by the end of the play she does not change in any significant way. She exists solely to offer a purpose for Berniece and establish her as a character rooted to tradition and family. Without Maretha, Berniece might not be all that different from Grace, the woman that Boy Willie picks up and with whom he spends the night. Maretha is the root that keeps Berniece’s feet on the ground and out of Lymon’s bed. So, in that sense, Maretha is responsible for the way in which Berniece has developed as a character. Maretha represents a future that is no longer possible for Berniece: to become a teacher and enjoy a career that offers some social status and, perhaps, better wages. Berniece has accepted her own station in life, but, in her mind, Maretha’s life will be different—and better. Whether or not Maretha agrees with her mother, the reader cannot say for sure. Readers are offered one small hint that the girl might share her mother’s dream: her willingness to plug away at that piano, although she does not appear to be too good at playing it. On the other hand, the reader is also given a small glimpse into the feistier and more argumentative side of Maretha: during the hair straightening session, the girl seems uncooperative and unwilling to have her hair combed. However, the 1936 Maretha is still an unopened book. I believe that the playwright has purposely left Maretha ambiguous, simply because the conflict is not (yet) between mother and daughter—it’s between brother and sister. So Maretha simply acts as a mechanism to help keep Berniece on a straight path and, thus, more convincing as The Formidable Guardian of the Family Piano. So how might Maretha turn out? If she’s 11, then she was born in 1925, slightly too old for the Black is Beautiful movement of the late 1960’s and early 1970’s (See also Wikipedia), but just at the right age to know and appreciate the great African-American leaders of the 1950’s: Martin Luther King, Jr., and Malcolm X, among others. She would have read about the Montgomery Bus Boycott and, perhaps, rejoiced at Rosa Park’s defiance when she refused to move from her seat at the request of the white bus driver to accommodate a newly arrived white rider. She would have known about the 1954 Brown versus The Board of Education Supreme Court Decision that effectively ended discrimination against minorities in public education. She may have even attended Martin Luther King’s famous August 28, 1963, I Have a Dream speech in Washington, D.C. But, most likely, we will never know because August Wilson has never revealed much about Maretha.